Before I was pregnant I cooked recipes that had chicken in them ALL THE TIME. I loved to bake chicken. Now, the thought of chicken generally makes me want to hurl. (Classy, I know) So I haven't really done a whole lot of cooking lately. Last week however, I decided to make some beef stir fry. When Chris and I first started cooking, we didn't think the recipe was going to turn out well. I was partly bitter because we dirtied 3 pots and probably 4 or so bowls with all the prep and cooking. I figured a recipe that took that many steps was going to get messed up somewhere. But surprisingly, the dish was rather good. This recipe comes again from my favorite place, allrecipes.com. 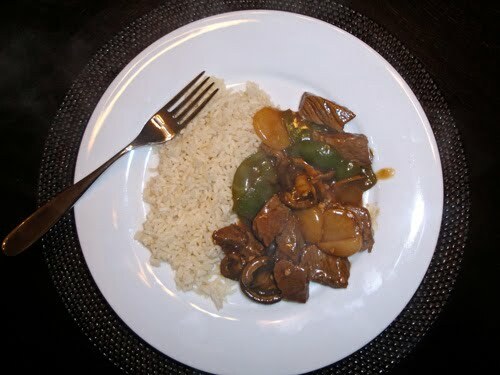 We substituted our own veggies (mushrooms, water chestnuts and green pepper), and I forgot to add the green onion. Both of us agreed that the flavor lacked a little kick (next time I think we will add a little bit of hoisin sauce) but overall was rather tastey. Hope you enjoy! And if anyone has some suggestions for easy recipes that don't include chicken, or tomatoes (I hate tomatoes!) let me know! We are in the teens people... and I'm talking weeks left! That really freaked me out. I have no idea what I'll do when I'm in single digit weeks. Probably hyperventilate every now and then :o). In order to calm my nerves Chris and I discussed what baby really NEEDED when she was born. 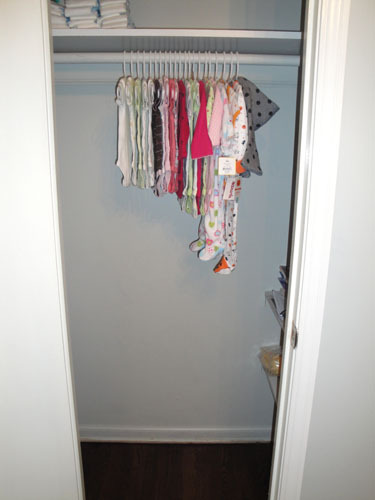 We came up with a place to sleep, something to eat, diapers, some onesies, and her carseat. Well we still need the place to sleep and the carseat, but other than that technically we could survive. That made me feel a little bit better! According to thebump.com, we are now just measuring the baby from head to toe. Lengthwise she is comparable to a banana at around 10.5 inches, and weighs in at around 12.7 ounces. Apparently her taste buds are really starting to kick in. Studies show that after birth, babies are most interested in tastes they've already experienced through amniotic fluid. So our lovely little girl is going to crave soup, chocolate and ice cream as much as I do? I better start eating more fruit :o). Other than finding it impossible to sleep comfortably I'm doing really well these days. I am loving feeling her dance around inside me. I swear on Thanksgiving she was having a dance party without me. She was moving all day long! Usually in the mornings and at night when I'm laying in bed, Chris can feel her kicking a little bit. It just makes me smile. Gotta love family togetherness. On Thanksgiving Chris's family had a little surprise shower for us. We had some cake and got some really nice and adorable little baby gear. Our little girl is already so loved. Thanks guys! I think it is safe to say we have an excited grandma-to-be on our hands! Aren't little girl clothes the cutest? 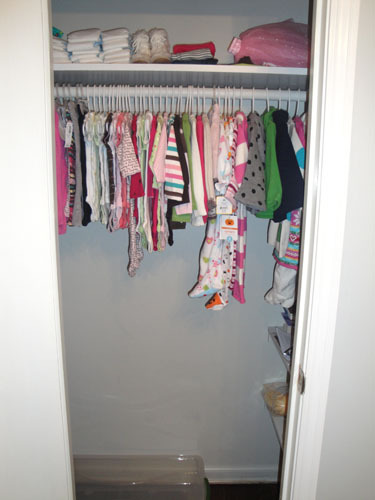 My only peeve with little girl clothes... do they really all have to come in just pink? I know there is a little variation here and there, but when we have been in BabyGap or Old Navy it looks like someone threw up pepto everywhere. Oh well, I am still going to have one of the best dressed daughters ever! Before I begin... Happy Thanksgiving! Hope everyone had a great day stuffing their faces with turkey and potatoes... or whatever it is your family eats on this day :o). Now, the beer cheese soup adventure, part one. 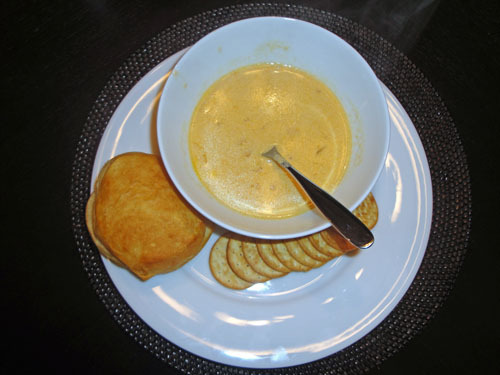 From my baby posts you may know that I have been craving beer cheese (or cheddar ale) soup like crazy. So I thought I'd be clever and make my own. First attempt? Relatively good flavor, but for some reason the soup came out kind of grainy. I felt like even though I hate too much spice, this soup was lacking a little kick. Overall for my first attempt, I would call it a success. But I decided that I need to try out a few more recipes, hence part one of the adventure. I have a few more recipes that I will try out in the next couple months or so. I used a modified version of this recipe from allrecipes.com (I have tons of cookbooks, but still love finding recipes on that site. So convenient!) Based on some of the reviews, I added an extra cup of cheese, and mixed the cornstarch with a little bit of chicken broth instead of adding water. Who knows, if I had followed the recipe exactly maybe the soup would have been perfect. Oh well! For comparison, here is where I started (4 weeks) and where I am now! If this is only halfway... what am I going to look like at oh say, week 38? Eek! As for me, life has been fairly good. Most of the time I feel great. I get tired a little more quickly than I used to, and I definitely am starting to have some pain with all my ligaments, but overall I shouldn't complain too much. Our little girl is going to be active, I just know it. For a while I was getting discouraged that I wasn't feeling any movement at all, not even a slight flutter. But now I feel her wiggling more and more each day. Last night I got up to use the bathroom, when I came back to bed I tried to snuggle into my usual position... half on my stomach, half on my side. Well she wasn't having it. Every time I was more on my right side she kicked me over and over again until I moved. Demanding little one! Sleep: eh, could be better. Milestones: making the halfway point! Me: I don't see myself as someone who will go into labor early, but just to be on the safe side, I think we need to plan on being ready for a baby around 36 - 37 weeks. Chris: Yeah, that makes sense. Chris: You know what I'm worried about? I reminded him that the hospital does have TVs, and as long as I'm not actually in the process of pushing the kid out, I think we will be fine. :o) Plus who wouldn't want to have a kid and win the national championship in the same day? Getting bigger and rounder everyday! (I'm not sure whether I'm excited about that or not :o) I'm also starting to feel what I think is the baby moving around. 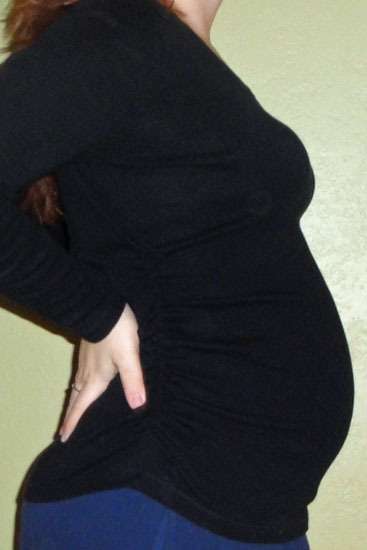 No distinct kicks or jabs yet, but I feel some random pressure, like maybe the baby turning from side to side. Hopefully soon I will know that it is for sure baby! Our little girl has reached the size of a mango (I LOVE mangos! ), 6 inches from head to bum and about 8.5 ounces. On Tuesday the ultrasound tech said she measured at around 8 ounces. Her arms and legs are in the right proportions to each other and the rest of her body. She is also starting to form a waxy protective coating on her skin to prevent it from pickling in the amniotic fluid. I mean come on, what would you look like if you sat in a bathtub for 9 months? Best moment this week: Finding out we're having a little girl!! Movement: maybe just a little! Milestones: finding out we're having a girl! And just for Kenzie... she said I was looking 'extra bumpy' on Friday. I'm not sure these pictures really do it justice, but oh well. For our little girl's nursery, I don't want something too cutesy. No little baby animals, Disney characters, things of that nature. Its just not my style. 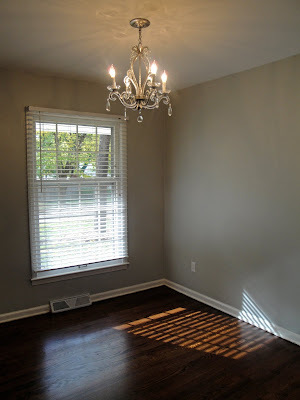 We originally painted the walls gray, and hung a fabulous chandelier when the room was going to be mine. Thank goodness like I said, the chandelier can stay! I think I want to leave the walls gray, and then incorporate yellow, white and a little bit of hot pink into the room. 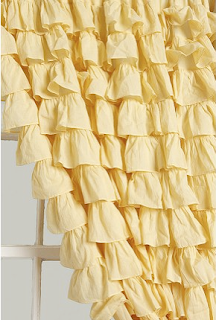 All little girls need some ruffles in their life right? 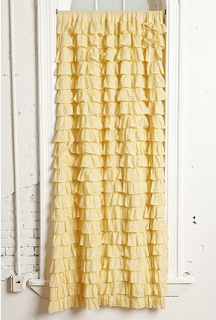 So I am thinking these curtains from Urban Outfitters might be necessary. What do you think? We are so incredibly excited. This morning I was just sure it was going to be a boy, so when the tech finally said 'she's a girl!' I asked her multiple times if she was sure. I believe her, and she printed me a picture so I can check multiple times if I need to, but I can't believe I'm going to have a daughter!! Now I can't wait to start decorating the nursery!!!! The rug that I ordered for the living room early in September finally arrived on Friday!! We decided since there was so much color in that area of the room already, that something a little more subtle would be perfect. So we ended up with this fun brown number. 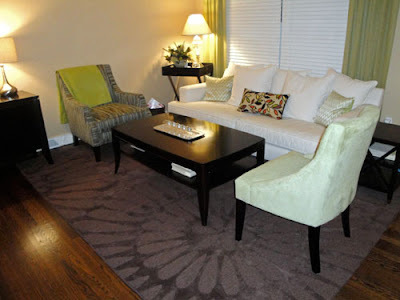 It is the greco rug from Home Decorators. I like that it adds some more texture, and another soft spot for feet to land amongst all of the hardwoods. So I've gone from almost nothing to huge in like three weeks. 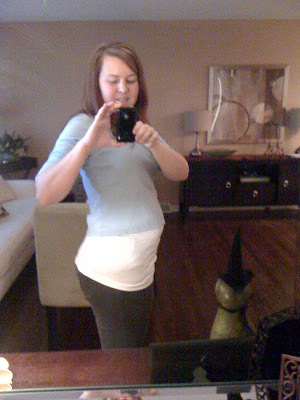 I'm not even halfway through my pregnancy (almost though!). I am pretty sure I am going to be the goodyear blimp. Baby is now the size of a sweet potato, 5.6 inches and 6.7 ounces. The baby has become amazingly mobile, passing the hours yawning, hiccuping, rolling, twisting, kicking, punching, sucking and swallowing. 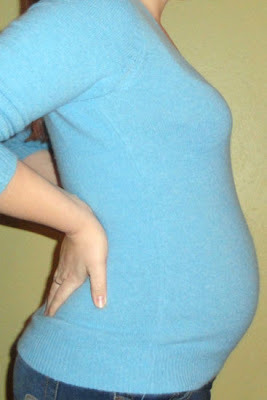 And the baby is finally big enough that I should (my fingers are crossed!!) be able to feel the movements soon. 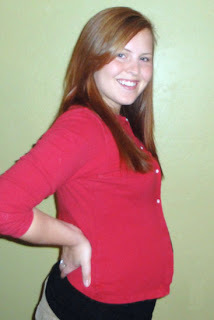 Maternity clothes: I love my elastic pants. 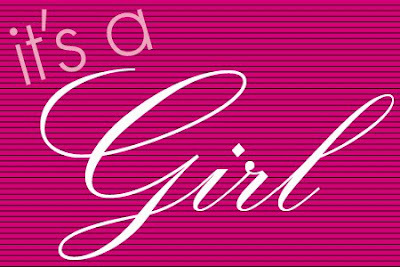 Make sure you check back Tuesday evening to find out boy or girl! ... it had gone beyond short. My belly button was right at the line where the blue shirt ends and my tank started. Good news, the HR girl said she would trade me any company issued shirts for larger ones. right about, oh, now. If someone wants to bake these delicious brownies and bring me some I would be ever so grateful. 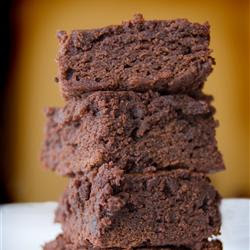 I found this recipe here at allrecipes.com, and it turns out some of the most amazing brownies I've ever had. 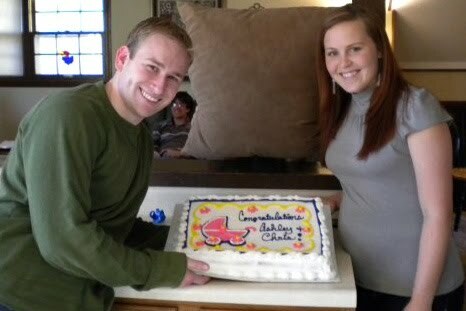 We are at one week and counting until we find out if Baby J will be a mini Chris or a mini Ashley :o). I can't even begin to describe how anxious and excited I am. Originally we all thought I was going to have a boy. Now I'm starting to lean towards a girl (maybe because I am love with all the little girl clothes an nursery decor :o). Of course either way I will be happy, and just thrilled to know, but if there happens to be a little girl in there I will be over the moon! So what do you think? Participate in my poll and we will see who is right!